Dazzling Dentistry has provided personalized dental care to thousands of families. Our patients come from near and far to experience the warm, individualized care we provide. We pride ourselves in utilizing the most modern equipment and methods available to make your smile dazzling. Our practice now offers the revolutionary Bioclear Method, a minimally invasive and innovative approach for treatment of dental black triangles and other cosmetic issues by creating highly cosmetic fillings. Click to see before and after pictures. 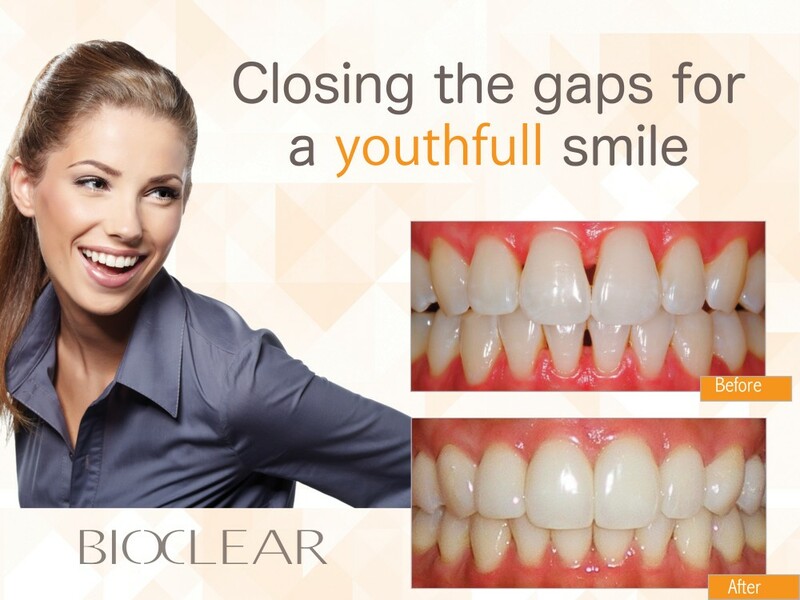 Bioclear Method - a minimally invasive and innovative approach for treatment of dental black triangles and other cosmetic issues by creating highly cosmetic fillings. Custom designed mouthguards and nightguards are made of flexible plastic and are molded to fit the shape of your teeth. Mouthguards are recommended to protect the jaw and teeth during physical activity and sports such as boxing, football, basketball, or other activities where your mouth may get hit. In addition, these guards protect the soft tissues of your tongue, lips and cheek lining. Nightguards are also recommended for patients who clench or grind their teeth at night as a way to protect their teeth and bite. If you have decided a guard is right for you, the dentist will take an impression of your teeth which will then be sent to a lab to make a custom fit guard for you. In most cases, you can choose from a variety of colors and styles for your guard. On average, guards last between 3 and 10 years. Dental implants are used for replacing a missing tooth or teeth. They can help in the retention of an existing or new removable partial or complete denture. The procedure is most commonly a two stage surgery. The first phase is for the placement of the dental implant. A short period of time is allotted between the 1st and 2nd phase to allow for healing and osseointegration. The second phase is for the restoration of the implant with the abutment and full coverage crown. The Invisalign System work begins by first creating a series of trays that will each move your teeth gradually until the end result is achieved. At the end of each two-week period, you will switch trays. Throughout the process, you will visit your dentist every six weeks to ensure treatment is progressing as planned. Once your treatment is complete, you will likely wear a clear retainer to ensure your new smile stays in place. In our office, we use digital radiography which allows us to take x-rays using up to 90% less radiation than conventional film x-rays. Using this technology, we are able to take an x-ray of your mouth by using a small sensor which records the image of your teeth and sends it to a computer. The result is a highly detailed image of your mouth that can easily be enhanced to better diagnosis, dental concerns and determine the very best treatment for each case. Bonding involves adhering composite resin material that is matched to the color of the tooth, to the front of the tooth. This is done to repair damage done to the tooth by decay, to alter the alignment of the tooth, close gaps between the teeth, or for cosmetic purposes. First, the surface of the tooth is roughened in order to accept the bonding and hold it. A gel is applied to micro etch the tooth surface, and a primer/bond agent is applied so the material adheres to the surface. Then, the material itself is placed on the tooth and hardened with intense light. The composite resin material is shaped and polished to get a lustrous finish as a last step. A denture is a removable replacement for missing teeth and surrounding tissue. There are two types of dentures available, including partial and complete dentures. Partial dentures are used when some natural teeth remain, while complete dentures are used to completely replace all teeth. Dentures are made to resemble your natural teeth so there should be no noticeable change to your appearance. In fact, dentures may even improve your smile! Tooth whitening is a popular procedure to make teeth whiter and brighter, and therefore, more attractive. Bleaching can be used to whiten stained and discolored teeth, or simply to enhance a dull smile. Either way, tooth whitening is a safe and relatively painless procedure ideal for most patients. Our office offers two methods of whitening: in-office whitening and tray whitening. We use an automated appointment reminder system that will email you prior to your scheduled appointment time reminding you of your appointment. We also text your phone ahead of time to remind you. You, as the the patient, can also go online and econfirm your appointment. If you do not respond to the messages, our office staff will contact you to confirm your scheduled visit. If you are not home, a message will be left on your voicemail. Failure to notify our office of a cancellation may result in a charge. See our missed appointment policy for more information. The dentist performs most of her dental procedures while wearing a pair of funny looking glasses called surgical telescopes. These powerful glasses have magnifiers on them, allowing the dentist to see fine details that would go unnoticed to the naked eye. Veneers are a dental procedure in which a covering is placed over the outside (visible area) of the tooth. Veneers are usually done only to the part of the tooth that is visible when talking or smiling. The procedure can be direct or indirect. After careful examination and treatment, the dentist may advise you to have a tooth extracted. Before a tooth is removed, the dentist will take an x-ray in order to understand the shape and position of the tooth and surrounding bone. Based on the degree of difficulty, we may refer you to a specialist called an oral surgeon. Root canal treatment (also referred to as root canal therapy or endodontic therapy) is made necessary when a cavity is allowed, through neglect, to reach all the way to the pulp. (Regular cleanings and checkups prevent and detect problems early). Sometimes deep restorations or trauma to a tooth may cause the nerve to be damaged to the point that it needs root canal therapy, also. Once this occurs the pulp becomes infected, and can even extend through the root tip and begin to eat away at the surrounding bone (this is an abscess). By the time the pulp is infected it must be treated, and cannot heal on its own. It can even weaken the entire immune system. This is dangerous, not to mention very painful. Symptoms that the pulp has become infected may include sensitivity to hot/cold or sweets, pain, swelling, pain to biting or pressure, and a bad taste in the mouth. Sometimes, however, no symptoms are apparent and the person is unaware of any problem until a checkup. A root canal is then performed to clean out the infected tooth pulp, and disinfect the canals of the tooth. The only other treatment would be to extract the tooth. Once the infection is resolved, the canal(s) are filled in to prevent any further infection. Usually, a core build-up and crown is recommended for restoring a tooth that has had root canal therapy.